On Saturday, efforts to create a war memorial in the Town of Speedway will get a financial boost. SPEEDWAY, Ind. -- On Saturday, efforts to create a war memorial in the Town of Speedway will get a financial boost. 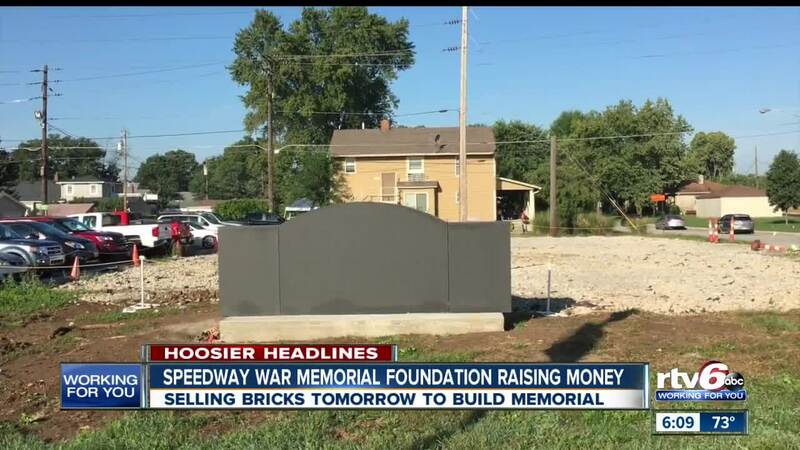 Members of the Speedway War Memorial Foundation will be selling bricks to raise money for that new marker. The memorial will be dedicated to Speedway residents killed in action since world war one and is being built at the corner of 11th and Main streets, just north of Charlie Brown's restaurant. War Memorial Foundation founder Steve Arisman said those honored will be two service members killed in Afghanistan and one in Vietnam. He also expects to add the names of three men killed in World War II--once they’re verified. Arisman said that sacrifices made by the service members and their families must be recognized. The basic monument is there, but the landscaping, bricks, service insignia and names still need to be added. Members of the speedway war memorial foundation will be selling bricks on site Saturday from 3-7 p.m.
Bricks honoring those who served are $100. Others can cost at most $20,000 and t-shirts can also be purchased for $25. The memorial is being built on land the Town of Speedway purchased from Indianapolis Power & Light Company for about $45,000 and is allowing the foundation to use. The goal is to dedicate the memorial on veterans day, November 11.